Hello, this is Shaheen over at WebUpon and this is episode number five of Chalk Talk Thursday. Today we’re going to cover something that I love, how to write really good, damn good title tags. As is my custom, I’m going to start off by talking about a little bit of the contention here with title tags, and whether or not they still really matter. Then I’m going to get into how you should think about title tags as headlines, as brand ambassadors. 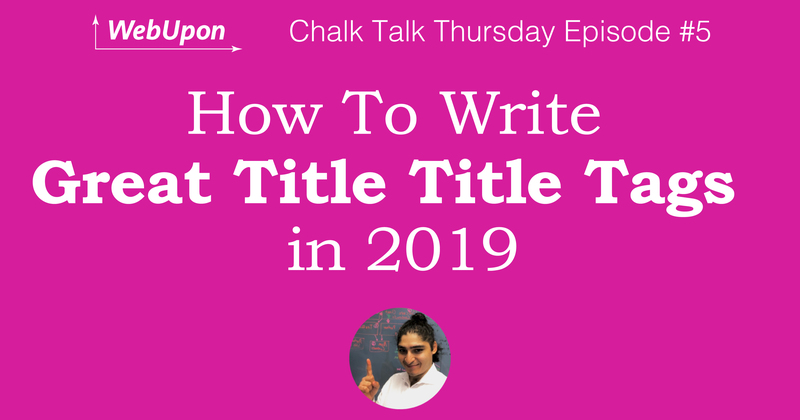 Then, we’re going to break down how to really assess your title tags, where they are, and how to optimize them further. Just to start off here, a pretty common question I get, and something that’s sort of just floating around is, do title tags still matter? I think it’s a fair question, but at the end of the day when you look at it from the sort of reverse position as far as Google’s concerned, and as far as customers and you as the business owner is concerned, you can still destroy your rankings with a bad title tag. If I can get in there and change my title tags on a page that’s ranking number one, and get it to rank number four, five, or six, or whatever it may be pretty quickly there. That should let you know that despite other tactical factors, and perhaps your brand recognition, you can still really do a lot, or do a lot of damage with title tags. In my mind, they still do matter. A few things to think about here, and really at the end of the day I think this is driven by the fact that there are developers who sort of view SEO as an amorphous, not legit process, like there’s not enough skillset in there. That’s a pretty fair critique, right? There’s a lot of shady SEO’s out there. 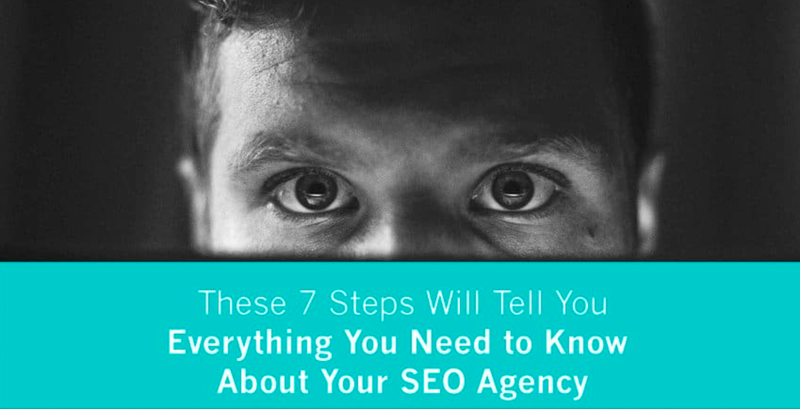 But, in 2019 when you hire an SEO, when you hire an SEO agency, you’re getting someone that has experience working within the SERP, and really getting more revenue for your business. I wouldn’t be in SEO if I couldn’t make my clients more and more money over time, and the fact that people don’t think SEO is legitimate is great for me, right? Because, that just means that everyone else is less competitive. There’s that component to it. There’s also just the fact that if you hire any SEO, you’re going to be getting someone that has this technical knowledge, but they also have experience with CRO, they have experience with content marketing, and they’re really assessing the entire funnel from top to bottom. We’re looking at search queries not as keywords, but as parts of topical areas, and we’re looking at them as opportunities to understand the customer as they’re coming in. It’s really psychographics applied to how is our specific target customer, Cathy who’s 27 from Omaha, how is she shopping on the site? That’s really how we’re using these title tags, right? The first question you gotta ask yourself is, how bad are your title tags? If you have terrible title tags, and there’s no keywords that actually match up to the page for the term that you want to rank for in your title tag, or anywhere else on the page. The fact is that, even as smart as Google is in 2019, you’re just not going to rank. It’s not going to happen. The second thing I will think about is, how goods your site generally speaking? A lot of issues can arise from the fact that you really can’t get around a poorly designed site, or a bad customer experience. Something that looks dated, something that people won’t trust. There’s no amount of technical optimization you can bring into that picture, and actually get it to perform at the end of the day. Just because it’s not good, no one wants to interact with it. Google’s not going to send people there because if we can’t send people there, if it’s not a good result, then we can’t sell ads against it, right? We have to think about Google as a company, and what their goals are, and always be working backwards from that situation, right? This is part of, this is principle number one as far as I’m concerned, when it comes to advanced SEO. The third thing you should be asking yourself, right? Is this question, title tags don’t matter, I can show you all these large scale ranking studies where they look at millions of keywords, and there’s just no math behind it. In my mind, this is really a correlation versus causation problem. Even though it’s anecdotal, it’s an N of 1. Well, you know, I’m one person but I have thousands of title tags that this has been applied to, and we’ve seen growth there. You should really be considering the fact that any website that’s massive, that’s an Amazon, or a Home Depot. Any large site that may be in your niche, is going to have the advantage of more brand recognition, they’re going to have the advantage of stores, and they’re going to be able to have pretty crappy technical SEO. The fact is that, anyone that’s a smaller competitor in a market, a smaller business, needs to optimize every single possible thing they can to get an edge. A good title tag is going to help you get that edge. That really just answers the question, do title tags still matter? Yes. Are they the solve all for all the problems you may have on the site? No, absolutely not. There are still going to be technical problems. You’re still going to have to think about how your brand interacts with other people. And, you’re really goin to have to think about the fact that your site isn’t just technical SEO. There’s way more to it. You have customers, and you need to work with those customers to show them something that they want to see. The reason why I love title tags so much is because it’s relatively cheaper compared to other tactics you could use on a site to influence rankings. If I come to a site and it’s poorly designed, it’s relatively harder to build 100 back links in a month. It’s something we can do over a year, but it’s just not going to happen very quickly. Title tags, as they exist on the organic SERP, until a day where’s there’s no organic searching, it’s just all paid, you can still influence how people are clicking. You can still get reception from real humans that are clicking through, and title tags are really just headlines. They’re advertising headlines, and hopefully they can be had for the cheap compared to these AdWords, the whole Google ads ecosystem. You need to think about title tags as headlines, as quality advertising copy. And, really the ambassador for your brand on Google, and also these can get used on social networks as well. You have to be thinking about the whole alignment of the brand, and not just the sales. But, obviously we’re just trying to drive sales at the end of the day, right? The first thing I’ll say here is, as far as any good title tag goes, you need to include some keyword, right? 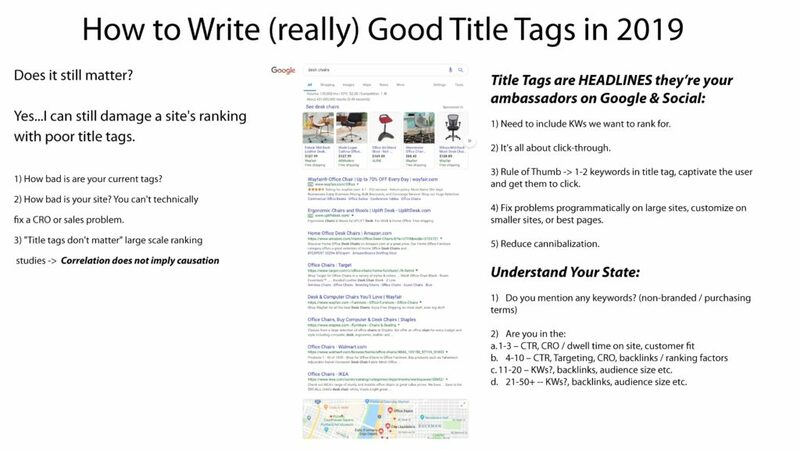 If you find yourself not ranking, it’s probably because you’re not using the keyword that you want to be ranking for in the title tag. It doesn’t necessarily mean that you’re guaranteed to rank for it, but you gotta mention it somewhere, right? The second thing to think about with title tags is, at the end of the day it’s really all about CTR, right? If you look at the modern SERP, I just typed in office chair, right? You have Google shopping right here, which is this nice little carousel of products. I’ll talk about this more in a second, right? Then you also have ads. Fun fact, I was running this a second ago. Because I have an international client, I was still on a German server, and they don’t have this extra little ad bit there. We just get tons of ads in the US, which is, you know. It is what it is. Then, you actually have your organic listings down here, right? You have six organic positions, and then you have a map. This is really what a modern SERP looks like, right? This is what a modern search engine results page looks like. On a cellphone, this is going to be one thumb scroll right here, and this is going to be another thumb scroll. You’re really fighting for attention. It’s very difficult to really get users to see you on the SERP at this point. You want to be thinking about the fact that my title tag is basically an advertisement. It’s an entrée into the brand. It gives users an opportunity to click in and start interacting with you. It’s just getting harder and harder every day, which is why we need to get better and better at it every day as we progress, right? The third thing I’ll say is, as a general rule of thumb, you want to make sure you have at least one or two keywords in your title tag. Any more than that and you get the old school typical SEO title tag, which is, “Office chair, chairs for office, red office chairs, chairs for cheap, chairs for sale.” No one wants to click on that. Google’s not going to rank it in most cases. You want to just use one or two, and then from there think about the fact that, how do I get my customer, how do I get Jan, how do I get Mike? The people that I sell to every day, to actually click on this title tag? The fourth thing I’ll say is, as a general sort of strategy tip, I think on large sites you want to be programmatic. If you have 15,000 title tags on a massive eCom store, this is actually one of my favorite things to do. You want to get in there, and you want to actually fix title tags in bulk. If you’re on a smaller site, let’s say you only have 30 pages and it’s a lead gen site, you want to think about them one by one. Then, just generally speaking, you always, always, always want to be focusing on the pages that are already ranking, right? Focus where, if you’re fourth, think about getting to first. If you’re tenth, thinking about getting to sixth or fifth, right? But, if you’re not anywhere, then you need to sort of start getting towards the top 10, and that will actually get you traffic, right? If you’re one or two you’re going to get so much more traffic than in any other position. You’re going to get seen by most people, you’re going to get that nice brand exposure. But, if you’re seventh, or tenth, or fourteenth, you’re hardly ever going to get seen these days unfortunately. That’s just the reality, right? The fifth thing I’ll say is, reduce cannibalization. This is an excellent rule of thumb right here. On a large site, typically what I’ll see is, you’ll basically get 100 title tags where the first two keywords are exactly the same keyword, right? I was … Not to call anyone out, but I was look at [Dakine’s 00:09:21] site the other day, right? It was like, “Men’s, outdoor, hoodie.” Down for 300 columns, right? All men, outdoor, hoodie, great. We get it. Then it’s red, XL, red, large, red, medium, red small. Brown, large, brown, you know? On and on and on. Not a lot of variation. When Google sends a user to that site, when Google’s crawling it as a bot it’s basically saying, “Wait, which page is what? Which one do I care about the most?” Because you’re not optimizing for anything, you’re not spoonfeeding the right answer to Google, you’re really not getting anywhere, right? This is an issue that is basically called cannibalization. You’re making 100 pages basically target the same keyword. What you really want to be doing is, when someone actually types in, “I need a medium, brown sweatshirt.” Or, “I need a large yellow and red outdoor ski pant,” that you’re popping up because you’re so specific that Google is basically about to determine that, that page is focused, hyper focused on that keyword. If I’m just saying ski pants, well then, the use case has really just sent me to a top level category page ’cause they don’t know what I want. I’m going to see hundreds of ski pants, right? 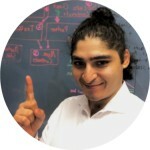 That’s really how Google’s working, and that’s the situation that you need to be optimizing in. Again, rules of thumbs here. When we think about CTR, we want people to click on us, we want to include one to two keywords. I’m sorry, but in most cases if you’re not optimizing a page for some keywords, you’re probably not going to rank for it unless you benefit from having a massive back link profile, or huge brand recognition in the space. That’s why SEO works, right? It’s these little tweaks where we can get people to just move from the seventh position, up to here. And, maybe from the sixth position to the third, then the first. Then we get more, and more, and more market share. That’s what we’re really after here. Let me just break down how to think about your current rankings, and that will then tell you how you should go about rewriting title tags as you proceed. I like to break this down into four main quadrants. Sam Rush does this as well, and I’m sure other tools make it pretty easy for you to look at your keyword rankings in this exact manner. The very first category is the one to three, right? The first, the second, the third, and I’ll even say the zero ranking with the search snippet. That’s the very, very top. That’s where you’re going to see most of the traffic. Generally speaking if someone’s going beyond the top three results, they’re probably not finding what they want in those results, so you’re probably selling something a little weirder. That’s a different play, and we can talk about that another time. Or, the four to 10. This is where you will see some traffic, especially on desktop. But, you’re really not going to be in play on mobile. At this point, I view four to 10 as aspirational for one to three. In my world two years ago, it used to be good to be in the top 10, you used to be able to get some pretty decent traffic. But at this point, everything to me is just spitting distance until you’re in one to three, because once you’re in one to three you’re actually going to get some traffic, you’re actually going to get some revenue, and that’s where you want to focus on. Then, there’s the 11 to 20, and the 21 through 50. This is page two to three, and then beyond that essentially. Here, you’re in worse off shape than the four to 10, right? You’re either just completely off base, and you’re not going to be able to target anything. Or, you just haven’t optimized at all, and you have a variety of issues. To break this down a little bit, let’s go and look at the SERP again, right? Here, you got shopping ads. That’s not good for us SEO’s, right? And, we got ads here. Again, this is probably around a thumb scroll or more on mobile. Then, we start having organic rankings right here, right? This is probably what we’re looking for. There are a few different things that you really want to be exploiting in this situation, right? You probably want to make sure that the keyword you want to rank for is in the first couple words here, very specific again. We want to be very, very specific and precise with how we’re targeting. You probably want to make sure that you have this primary keyword, and the secondary keyword that you want to rank for in there. You probably want to make sure that Google is bolding a few of these terms. I’ll get into meta descriptions ’cause I think that’s an entirely different art that deserves its own video. You want to be focused on these things. In the one to three range, this is where you’re going to get most of the traffic, right? If you’re two and you’re three, you want to be thinking about CTR. You want to be thinking about, what words can I include in here, that are going to get my users to click far more often, so I can jump ahead of everyone else? You’re going to be wanting, thinking about CRO and dwell time. When people get to my site, are they finding what they want quickly, are they not getting confused, are they staying on my site a long time? Especially if it’s content, or if it’s a product. Really, at the end of the day, are we selling anything, right? You want to be thinking in that way also, ’cause it’s not just about rankings. It’s really about sales. Then, you want to be thinking about customer fit. If you find yourself number three and you just can’t get out of it. If it doesn’t feel like something that you’re ever able to get out of, that you’re just stuck there. You want to really be focused on asking yourself, am I hitting the things that my customers really care about with this page? Am I getting them to click? Am I covering the product in a way that they like? Are they interested in it, or are they just bouncing out and going down further in the list, or going back to number one and number two? That’s what’s really going to hamstring you from better performance over time. If you’re in the four to 10 range, and in this SERP for office chair, right? We got shopping carousel, we got ads traditional, then we actually have a map pack, which is even better, right? Being in the top 10 here really means that we got to be in the top six, and then maybe we’re going to be three … You know, we’re going to be the last three or four on the bottom. It’s not ideal. It’s really not good. By the time people are here, they’re probably looking for office chair right now. Even if you’re Amazon, that’s going to be pretty hard to procure. If you’re in the four to 10 range, or the four to six range in this situation. Just keep in mind, given mobile, given where Google’s going, how are they going to squeeze more profit out of the actual platform, right? It’s just going to be harder and harder to get at this organic spacing, right? If you’re in the four to 10, it’s essentially the same thing. You want to be thinking about CTR, you want … Basically getting people to click. You want to be thinking about CRO, the quality of the experience on the actual page. Then, I would say you want to be thinking about back links, right? Technical SEO. Have I done everything? Have I built enough back links? Generally speaking in the one to three range, you’ll actually see that there can be a disparate allocation of back links essentially. There may be an authority that’s ranked forever, and that’s what’s going to be number one and number two. There’s other people like Amazon that has a million back links, but they might be number three. The, number one might be a site with a decent amount of back links, sort of above the norm. But, they also have a really great title tag, or they’re really well known in that specific industry. Everyone else down here, if you’re in the four to 10, you probably should assess whether or not you need to be doing the work on the technical side, to build more back links there so you can actually perform. But, that’s just sort of what you’re left with, right? If you’re in the four to 10, you want to be thinking about the same things, right? It’s all about this customer experience. But, you also want to be saying, “Okay, are there actual technical SEO issues that I need to solve for? Why am I stuck down here, how do I get in the one to three?” Thinking about it in this way is really the way to reverse engineer it as far as I’m concerned. Then, if you’re in the 11 to 20, or the 21 to 50 range, you’re basically trying to get onto page one. You’re trying to get into this coveted spot, the top 10, the top seven, the top six, whatever it may be given the constraints of the actual Google result page, right? If you’re here, you want to be thinking about keywords and back links, you probably want to be thinking about CRO and general sort of audience fit, quality of the site. If you’re 11 to 20, that’s typically a pretty good achievement I’ll say also, right? If your niche is more competitive, even though you’re way down there, it’s probably fair that you could rank in the top 10. You just have some work to do. Then, if you’re in the 21 to 50, or even all the way up to 100, we have a ton of work to do. Generally that means that you’re either not targeting the keywords that you want to be ranking for anywhere on the site pages. Or, you’re just not an authority as far as Google’s concerned, which is probably the worst situation to be in, right? If your primary service is something that you can’t rank for, you can’t even rank in the top five pages. That’s a pretty bad spot to be in, right? You probably have some content marketing work to do, some site copy work to do, some general SEO work to do, and just presence. Really, at that stage, you probably just want to be spending aggressively on AdWords, and just getting out there and basically making calls. Because, you’re so far away from where you want to be that it’s always going to be a problem. The other thing I’ll say too is, if you find yourself stuck in the 21 to 50, you might want to think about niching down. It may just be an issue that you’re targeting something way to broad. “I sell 100% linen sweatshirts with the finest New Zealand wool stuffing inside of them, and they’re the greatest sweatshirt ever. But, I can’t rank top 10 even though I make the best product.” Well, there’s probably some keywords, luxury, sweatshirt, or whatever it may be. There’s probably other keywords that you should niche down on, where you can actually perform well. Because, to the average consumer out there who wants to see 1,000 sweatshirts, you’re just never going to be anywhere on their map. That is my breakdown for how to write damn good title tags in 2019. If you have any thoughts, or you have further questions, or you think I’m crazy. Please let me know in the comments below, I would love to discuss this further.